Here are my favorite delicious sugar-free (or low-sugar) cookies to bake for the holidays, and many are gluten-free as well! And December 4 is National Cookie Day, so it’s the perfect time to bake some cookies. Use the Diet-Type Index to find more recipes like these. Click here to PIN Delicious Sugar-Free (or Low-Sugar) Cookies! Through many years of food blogging I’ve probably tried about 50 different variations for sugar-free cookies or low-sugar cookies, and yet not many cookie recipes have been posted on Kalyn’s Kitchen. That might be partly due to my poor baking skills, but it’s also because I feel there’s not much sense in making a low-sugar or sugar-free cookie if it doesn’t really taste good. Admittedly, nothing tastes quite like real sugar, which I’m sure is why so many people have a hard time avoiding it. But these Delicious Sugar-Free (or Low-Sugar) Cookies for the Holidays are all tasty, and all of them can be made with Stevia-in-the-Raw Granulated Sweetener or your sweetener of choice (or sugar, if you don’t care about the whole low-sugar thing.) Many of the cookies are also flourless, which makes them gluten-free as well. Of course making a cookie that’s low-calorie is another matter indeed, so use portion control when indulging if you’re trying to avoid holiday weight gain! In my experiments through the years with low-sugar baking, I’ve learned that whether you use Stevia-in-the-Raw Granulated Sweetener or another calorie-free sweetener as your primary sweetener, using a blend of sweeteners makes a big difference in the taste. Nowdays I prefer a blend of Stevia and Golden Monkfruit Sweetener, and I’m slowly testing out the various cookies with that combination. Most of these cookies were made with butter, but I’m guessing you can substitute coconut oil or Smart Balance in any of them if you prefer. First up, Flourless Sugar-Free Chocolate Shortbread Cookies that are also gluten-free. 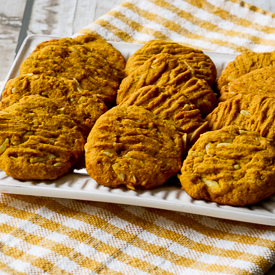 These cookies use butter and almond meal so they’re definitely calorie-dense, but delicious! Low-Sugar Coconut Almond Macaroon Cookies use unsweetened coconut, and even though that keeps them from being sugar-free this is a pretty low-sugar cookie. These cookies are also gluten-free and Phase One for the South Beach Diet. Sugar-Free Flourless Cookies with Almond Flour and Flaxseed taste a bit like Snickerdoodles, with a flavor that’s slightly more complex. These are gluten-free. 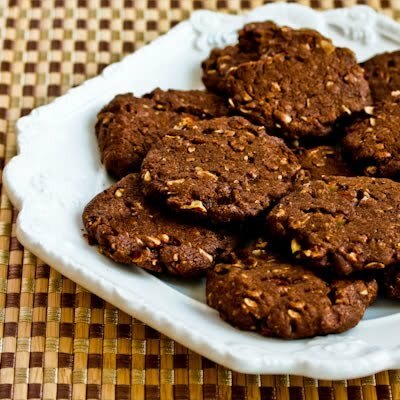 Whole Grain Low-Sugar (or Sugar-Free) Chocolate Cookies with Pecans are a healthy cookie made with whole wheat flour. These Sugar-Free Gluten-Free Triple Almond Cookies have almond butter, almond flour, and chopped almonds in the cookies, and if you really want a strong almond flavor use the optional almond extract. Low-Sugar and Whole Wheat Ranger Cookies with Pecans, Coconut, and Chocolate are a reduced-sugar version of the famous Ranger cookie. If I had to choose a favorite cookie, it might be these Flourless Sugar-Free Peanut Butter Cookies that are also gluten-free. My first cookie success with coconut oil (instead of butter) was these Low-Sugar and Whole Wheat Pumpkin Cookies with Almonds and Coconut Oil. These Flourless Sugar-Free Peanut Butter Chocolate Cookies are also gluten-free. 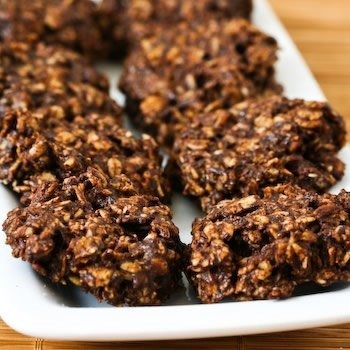 Sugar-Free and Flourless Chocolate Oatmeal Cluster Cookies are a tasty cookie made with oatmeal, and if you make sure the rolled oats are gluten-free this is a gluten-free cookie. 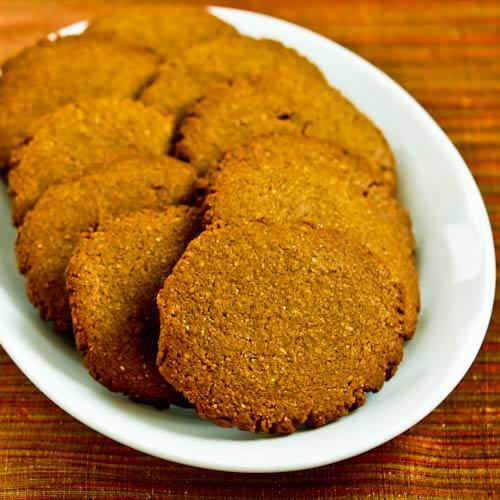 Low-Sugar and Whole Wheat Molasses Almond Cookies are another of my personal favorites. 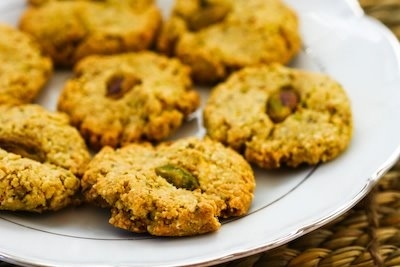 Flourless and Sugar-Free Pistachio Cookies are also gluten-free. This is a tiny cookie that’s really fun for Christmas. 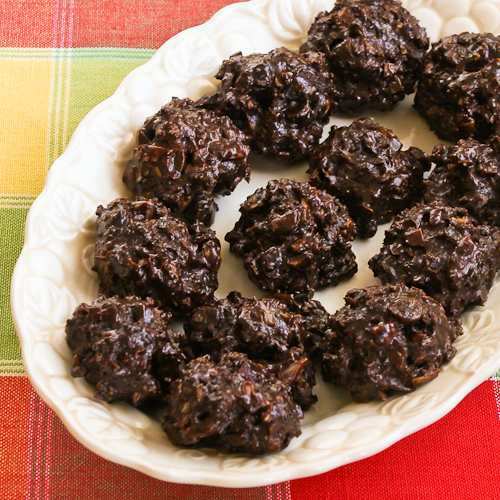 We loved these Low-Sugar and Flourless Chocolate Coconut Drops with Almonds, and these are gluten-free. I hope those of you who are limiting your sugar will enjoy trying one of my sugar-free or low-sugar cookie options! I made your Low Sugar and Flourless Chocolate Coconut Drops with Almonds. Is it really 3 cups of granulated Stevia? Stevia is considered 10 times sweeter then sugar, so wonder about this quantity. I made them and they really are very sweet – actually far to sweet. Could it be cut back? I have cut back on refined sugar in recipes but do not have a lot of experience with Stevia as I am new at working towards eating far less sugar. Thank you for your recipes I am looking forward to trying several of them. The granulated Stevia I used (that’s mentioned in the recipe) is supposed to measure 1:1 the same as sugar. You can see that information here. If you used a different brand or used a powdered Stevia that’s not granulated Stevia that could be why it tastes too sweet. I looked up the recipe in my notes and it does say 3 cups granulated Stevia. The granulated sweetener provides a lot of the bulk in that recipe so I’m not sure how it would work to cut it back. Sorry, wish I could help more but I’d start by checking to make sure you used exactly the same Stevia I linked in the post. By the way Barbara, just clicked through to confirm and the recipe that was adapted from used 3 cups powdered sugar, so I think that’s more indication that the 3 cups granulated Stevia is not wrong. Excellent, thank for making this list for us, we have a few in the family that have a special diet. Amy, so glad it's helpful for you! Scott, I think there are plenty of people who feel just that way! Low sugar is *so* good…I've spent ages losing my weight I don't want to gain it all again over Christmas if I can help it! Thanks Donna! I must have a few cookies, don't you think? Who says you can't have deliciousness without sugar? Not you! Thanks Dara. And if you have not tried Stevia-in-the-Raw, I bet you would like it! Wow, look at all of these fantastic ideas! Those chocolate and oatmeal clusters caught my eye. yum– all of these look great! Thanks Joanne! And so true. Lydia, I am hoping it can be helpful to anyone who's in that position. Cozy in Texas, thanks! Always appreciated. I am going to check out your blog. Jeanette, so glad it's helpful! Wow, love all these cookie recipes, especially since I am trying to bake gluten-free cookies this holiday season. Great roundup Kalyn! Stopped by to let you know how much I've enjoyed your blog posts this year. I have a link to your blog on my sidebar. Great selection of cookie possibilities for those of us who must watch our sugar intake, especially during the holidays. I think these days we all could use at least one low-sugar cookie at the holiday table. These look great!